If you've been following my project posts for a while you will notice that I have been working with the Quick Curve Ruler® since last October. This is the invention of sisters Jenny Pedigo and Helen Robinson of Sew Kind of Wonderful. 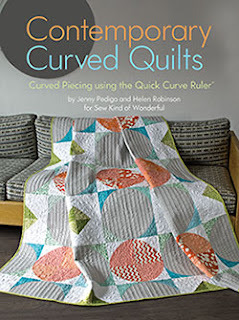 Today I'd like to tell you about their first book, Contemporary Curved Quilts. The book includes a well illustrated 'Techniques' section at the beginning of the book. The step by step instructions show you how to cut the curves with the ruler and your rotary cutter. Then they show you how to machine piece the curves without pinning. The result is the pieced curve shape that is used for the 8 projects included in the book. The first project (Crazy Eights Pillow) is a small project, perfect for giving the technique a try. 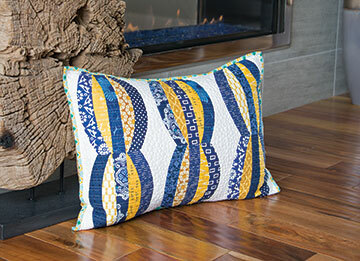 The following projects build on your skills and include a Table Runner, full-size quilts and a wall hanging. All the projects are beautifully photographed and I love how you can see the amazing quilting for each project too. 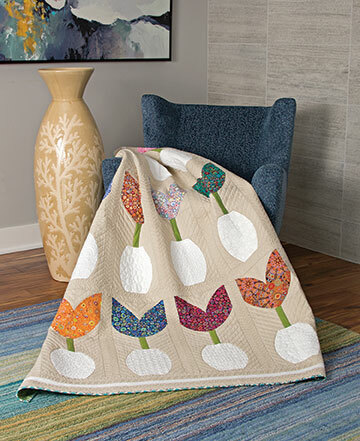 Several of these projects are on my 'to do' list including the Tulip Festival Quilt.